Reported by L.A.Times, a Metrolink train and a freight train scraped each other around noon today in Rialto, but no serious injuries were immediately reported. The Metrolink train, number 306, was going east, leaving Union Station for San Bernardino. The Burlington Northern Santa Fe freight train was going west, crossing in the area of Lilac Avenue. 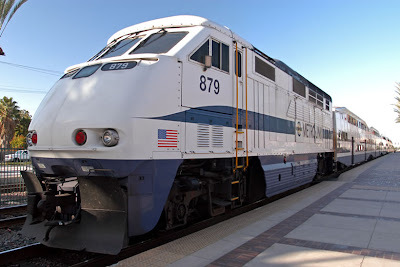 "No matter what happened it's not acceptable," said Keith Millhouse, the vice president of the Metrolink Board and a Moorpark City Councilman. "We'll have to figure this out. I have a zero tolerance for any type of incident, no matter how minor it is." So far, the Rialto Police Dept. says, there are "no major injuries." Five of the 15 people on the Metrolink train say they're in pain and paramedics are attending to them. UPDATE: The two trains collided in an area of single track just west of the Metrolink station in Rialto. The westbound Burlington Northern-Santa Fe freight train was pulling onto a siding when the eastbound Metrolink train hit the tail end of the freight train, said BNSF spokesperson Lena Kent. “We were cleared to go into the siding,” Kent said. “It had almost cleared the mainline when it was struck.” Kent did not know whether the freight train had been cleared by a signal or dispatcher. It seems that there are many uncertainties surrounding this incident. Please be cautious and hope and pray that these types of accidents will cease. a bigger WATTTTTTTTTTTT to them bumping into each other , am i hearing this right!?!? Yea, some are saying scrape, some are saying they bumped into each other. These are trains though, scrapes and bumps can cause damage and injury. My question is, tell it like it is...and why did this happen, especially after such a tragic previous accident.